FAU football was looking for their first wining streak in the same season since 2013 and under Coach Charlie Partridge when they took on UTEP tonight in Boca Raton. They got what they wished for on both accounts - and then some - deflating the Miners hopes to become bowl eligible with a 35-31 victory. Unlike many previously failed attempts, it manifested in come from behind fashion as the Owls orchestrated two touchdowns in an offensive clock span of just 5:19 late in the fourth quarter. "With seven and a half minutes or so we're down by 11 and there's just a different look in our kid's eyes", said Partridge. "The kids really played for each other and the coaches had a heck of a game plan." Quarterback Jason Driskel picked up his performance where he left off against Rice last week, taking the Owls 77 yards down the field on their opening possession for a touchdown. Running back Devin Singletary (145 yards, 2 TD) punched it in for the home team. However, an interception during the Owls' next possession by Driskel, then reserve Daniel Parr on the third FAU series, saw the Miners (3-7, 1-5) move ahead 14-7 early in the 2nd quarter. Devin Singletary lifted Florida Atlantic with a 38 yard score that showed his athletic ability, initially stopping on a dime to thwart a would be UTEP defender before racing outside on his way to the end zone. Soon thereafter, defensive back Jalen Young fumbled away the catch on a punt return for FAU's second turnover of the game, setting the Miners up at their 25 yard line. Young would then be ejected leaving the Owls without their leading tackler. The Owl defense earned a partial victory, limiting the Miners to just three points and Greg Joseph followed that with a 43 yard boot through the uprights just before the break to make it a 17-17 affair at the half. All UTEP points in the period were a result of Owl turnovers. A long run from Aaron Jones allowed the Miners to strike first blood in the second half. Joseph connected for his second field goal in response, this time from 25 yards away, and the Owls trailed 24-20 with 5:27 to go on the third. With Florida Atlantic unable to apply consistent pressure, the Miners milked over seven minutes off the fourth quarter play clock before going to the air for back-to-back plays that gave them a double-digit lead. Things looked bleak at this point, but history would not repeat itself. FAU (3-7, 2-4) used just 2:58 in their initial response, marching 73 yards to set up a Buddy Howell score from two hash marks out that was the predecessor to a two-point conversion leaving only a field goal between the two teams. The Owls' defense got a jolt when Trey Hendrickson made a crucial tackle on third and four to end the Miner's ensuing drive. "Really proud of the way he's fought to lead through all of the adversity we've faced this season", Partridge said of Hendrickson. With 2:36 to go the stage was set for another late heroics necessity from a staggering 96 yards away. They would not be undone. A Miner holding call pushed the Owls past the UTEP boundary with 1:03 remaining. Driskel (20-of-25, 233 yards, TD) next looked to favorite target Kalib Woods for 21 yards near the sidelines setting up a first and goal for the Miner's seven. He then tossed wide receiver Nate Terry (photo center) his first score of the year for the winner, leaving UTEP only :25 to counter and just one time out. "When you're a tempo offense if you can get the chains moving then that's going to give you an opportunity for a big play", said Partridge. Forced to go to the air, UTEP found themselves unable to play to their strength and threw an interception to FAU defensive juggernaut Ocie Rose to end the threat - sealing the win for FAU. Owl Punter Dalton Schomp was called on just one time for the contest, but made his mark with a 50 yarder. 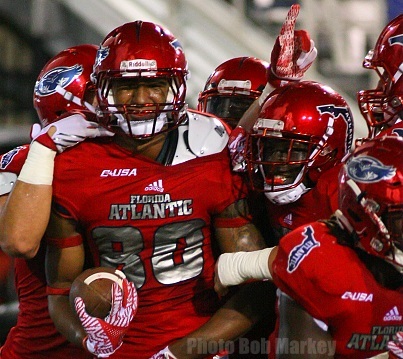 Linebacker Azeez Al-shaair was the leading tackler for Florida Atlantic with 11. FAU will conclude the home portion of their 2016 schedule when they host Old Dominion next Saturday at 6:00 PM at Schnellenberger Field. What a great last drive. When UTEP pinned us against the endzone, I had my doubts, but they definitely turned a corner with that 96 yard drive! Fun game for sure. Driskell is growing up and developing. He will be dangerous next year…so will the entire offense should the line stay healthy. Like to see us sign a JUCO TE that could have an impact next year.